Each year at this time, I try to come up with some type of holiday treat I can mass produce for my girls to take to school for their classmates. Each year I try to keep it cute but very simple! I never seem to have the time I expected to have to create the treats! As I went shopping to look for candy that looked festive, I couldn't find anything that I liked or if I liked it, it wasn't safe for Savannah's allergies. We were on our way to the cashier when I saw it and decided on the treat. . .a box of Swiss Miss Hot Chocolate packets! 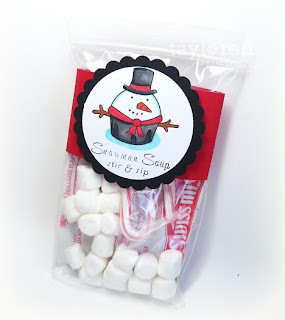 I picked up some mini marshmallows and mini candy canes, and I was all set to make some SNOWMAN SOUP! The most time consuming part of assembling the treats was the coloring, and that didn't take all that long! I put both the image and sentiment on one block, so I only had to stamp each piece once. 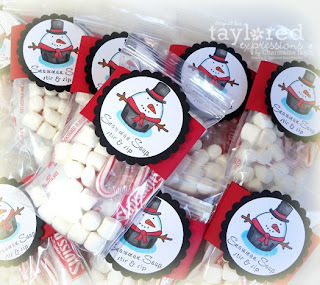 I used the Snowman Cuppie from the Home Sweet Home set, and the sentiment is from the old Tag Treats set. 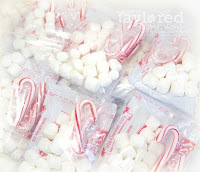 First I filled resealable treat bags with a packet of hot chocolate, a handful of mini marshallows and two mini candy canes. Next I stamped, punched and colored all of the images, cut the belly bands and added foam dimensional adhesive to the backs of the scallop circles and Scor-Tape to the end of the belly bands. love these! your coloring of the snowman is wonderful! 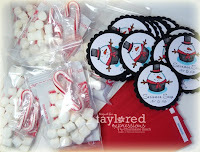 Adorable and a fabulous idea Charmaine!! I love giving the snowman soups as gifts. You did a great job with yours. Thanks for sharing. what a cute idea, I bet they were a hit!